Vikings and Chatting and Travis Fimmel, Oh My! First, I want to thank J and M for letting me hang out on their blog. I’ve been here since Day One (on the blog. . .) and I love to watch them “chat” and so on. So much fun! The only place I’ve really posted in a “chat” format was on my blog in conjunction with author Lissa Bryan. She and I discussed the History Channel’s original series VIKINGS every Monday for nine weeks. It was fantastic. You see, I write about Vikings myself. Just not the same breed of Vikings as were on the show, so I enjoyed very much seeing the variations in the culture of those in Scandinavia and those in Nordweg—today’s Norway. The latter are what I’ve spent years growing a bit close to, in one way or another. In my book Éire’s Captive Moon (book one of my Éire’s Viking Trilogy), I researched and wrote of the Northmen from Nordweg, who had a different social system from the people who lived in what are now Sweden and Denmark. Though I use the word “viking” in the title, the men themselves did not use that word so it isn’t actually used in the stories. They called themselves Ostmen,while others in Europe used the term “vikingr.” This could refer to a man who lives near a vik – or one who sails or roams on the sea. It is an Old Norse word, and I use Old Norse dictionaries as I write these stories. I did not use the old sagas as a basis for my writing, in general. Instead, I used what history I could glean from accounts from Éire—Ireland—and what has been found in archeological digs in Norway and Ireland. 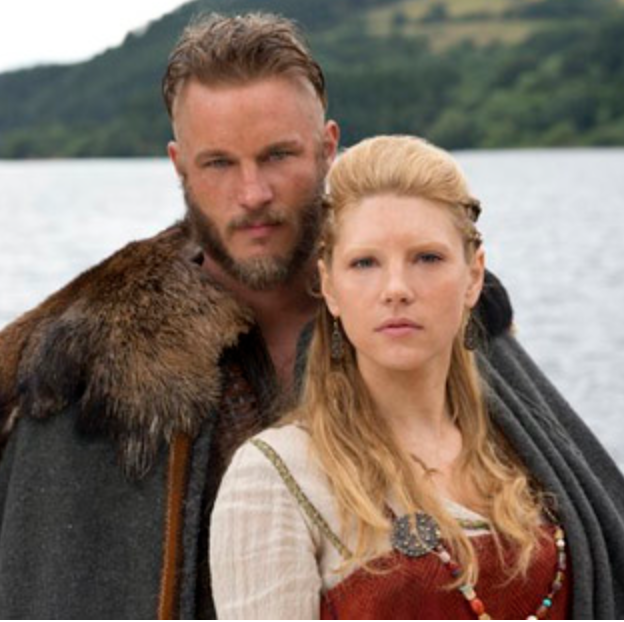 When Lissa indicated that the series has used some of the legends that came from the warrior Ragnar Lothbrok (there are alternate spellings, of course), I knew I’d have little knowledge of the plot that the series would take, though I did recognize much of the clothing and housing and crafts used in the series. And, of course, the fighting styles. The Northmen fought with battle axes and spears, mostly. Very few had swords as they were costly and hard to make. I did compare many things that I saw in the series to what I had found in my research, and many of the cultural references are the same. The leadership was different, involving a different political structure. Norway was not yet bound together as a cohesive body under one ruler at the time of my writing. I am really kind of relieved that I had the first book in the trilogy written many years ago, initially. Self-published as Captive Irish Moon, the book was finished in the summer of 2004. My research didn’t end there, though! I’ve kept at it and new finds have been discovered, which made my original timeline off and it was very frustrating. Getting the opportunity to adjust some of the details was great when ECM was accepted by my publisher. The original book is still the original story, but I’ve allowed myself to expand it through my notion of getting to the leadership of the only Viking who ever claimed the High Kingship of Ireland: Tuirgeis (also known by other names). Each of the three books in my series deal with the Norse culture of the early ninth century, including their clothing, beliefs, social structure and marriage customs. I also explore how the Ostmen invade Éire and settle there. I am relieved, as I said, because my story is told, in my head, for the most part. Book two was in editing by the time VIKINGS was broadcast on television, so I knew that there would be no subconscious borrowing of legends or materials or anything. For my personal mental health, this is a good thing. The second book of my trilogy is called Éire’s Viking and it should be out early in 2014. The third book is being written now and I’m calling it Éire’s Devil King as a working title. I know that History Channel is planning a second season of their show in 2014, but by the time it airs, my trilogy will be complete on my end, so I will enjoy the show as it is presented. I think that I was fortunate to have a book out on Vikings from the same era (more or less) as those in the History Channel show. I confess to shamelessly tweeting to my followers that if they just couldn’t wait for Sunday night and the next episode of VIKINGS, then they could buy my book for their Kindle and get more Vikings immediately. Did it work? I have no idea. Maybe? By the time the next season rolls around, Éire’s Viking will likely be out and I would like to hope that the contrast between what is likely to happen in the life of Ragnar Lothbrok and the what is happening in the life of Agnarr Halvardson, who chooses to settle in Éire, will be appealing. Wife of one and mom of two, Sandi currently resides in Maryland. Besides historical fiction, she writes contemporary inspirational romances – one of which will be released this summer. Her interests involve researching anything, autism, and learning how to spin by hand. Coffee and the written word are her addictions, and she loves the world before the sun lights the sky. This entry was posted in Characters, Finding Inspiration, Guest Post, Uncategorized, World Building, Writing Process and tagged finding inspiration, guest post, historical romance, history channel, researching, sandi layne, Team Agnarr, Travis Fimmel is yummy, Vikings, world building, writing, writing process. I put in a guest appearance this morning at Fight for Your Write. Topic: Vikings! Like…no surprise, eh?